by Chris Woodford. Last updated: July 27, 2018. Electricity is amazingly useful—but it can be amazingly dangerous too! Did you know that it takes only a fifth of a second for a strong electric current flowing through your heart to kill you? That should give you pause for thought if you regularly use electric power tools. Think about if for a moment: if you're using an electric hedge cutter and you accidentally chop through the cable, the electricity has to go somewhere. If the tool has a metal case, you're holding on to it, and you're standing on the ground, there's a very high risk that your body will form a "short circuit"—the path of least resistance for the current to flow through. It takes just the blink of an eye for a current that's doing you a favor to change its mind, zap through your body, and kill you. One way to reduce the risk is to use a clever protective gadget called an RCD (residual current device) or GFI (ground fault interrupter), which automatically shuts off stray currents before they can electrocute you, cause fires, or do other kinds of damage. Let's take a closer look at how these brilliant bits of equipment can save your life! 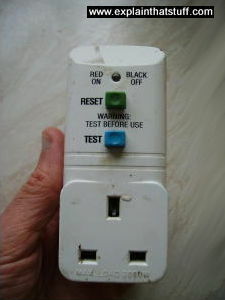 Photo: A typical RCD adapter with a three-pin outlet for the UK electricity system. Plug the RCD into your electricity outlet, plug your appliance into the RCD, and you're all ready to go. The blue button tests the device: press it in and you cause a temporary short circuit that should cut the power. The green button is a reset switch that restores the RCD to normal operation after a test or a real cut-out. In the United States, a device like this is more often referred to as a Ground Fault (Circuit) Interrupter (GFI/GFCI), though RCDs and GFIs/GFCIs are not completely equivalent. 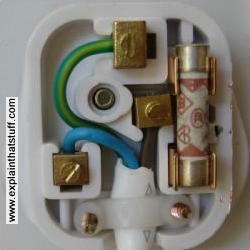 Photo: Inside a British electrical plug. The live (brown, right) and neutral (blue, left) wires form a continuous circuit that carries electricity into the gadget or appliance. The third wire (green and yellow, top) is the earth/ground connection. Usually attached to the exposed outer metal parts of an appliance, it's not normally part of the current-carrying circuit: it carries no current at all. However, it does become part of that circuit if the live wire fails somehow and touches the metal case. Figures vary from year to year, but US government statistics reveal that electrocution is one of the top five causes of death at work. It also kills and injures many people at home. Electrical accidents cause several hundred deaths and several thousand injuries each year in the United States alone. How and why do people get elecrocuted? Essentially, because they accidentally touch high-voltage equipment or because an electrical appliance fails in such a way that its exposed metal parts temporarily become "live" and dangerous. Many electrical appliances have fuses to protect against excessive currents, but they don't help in this sort of situation. Some appliances also have "earth" or "ground" cables to protect us when live cables touch things they shouldn't. The earth or ground isn't part of the normal power carrying circuit: it's just a spare cable, attached to the exposed metal parts of an appliance, connected eventually to the earth through your household wiring through a metal spike or water pipe that enters the ground outside your home. The basic idea is that if the live cable fails and touches something like the metal outer case of a toaster, the ground cable carries the current safely away. But what if the earth/ground cable fails as well—if you cut through it, for example? That's where RCDs and GFIs come to our rescue. If you've read our articles on electricity and magnetism, you'll know these two phenomena are like two sides of a coin—a single phenomenon called electromagnetism. Electric currents can produce magnetic fields, while magnetic fields can cause electric currents to flow. RCDs use the connection between electricity and magnetism in a particularly ingenious way. Suppose you're running a power tool such as a lawnmower. There are two wires coming from the electricity supply to the electric motor that spins the cutting blades. One wire is called the phase or live and the other is called the neutral. If you're unlucky enough to cut through one of these wires, the current has to flow somewhere. If you cut through a live lawnmower cable with a pair of stainless steel garden shears, for example, the shears, your hands, arms, and legs would form part of a circuit through which the electricity would flow. You could be dead within a second! But if the cable is plugged into an RCD, the RCD detects the sudden change in the current and breaks the circuit in around 30–50 milliseconds. That should be plenty quick enough to save your life in most circumstances. Artwork: A simplified illustration of a transformer. The copper primary and secondary cables are connected magnetically, via the iron core, rather than electrically. RCDs work in a similar way to electricity transformers; if you're not familiar with those, you might find it helpful to review our detailed article on transformers so you understand what's coming up next. In a transformer, two coils of copper wire (called the primary and the secondary) are wrapped around a circular iron core (sometimes called a toroid). By using different amounts of wire in the two coils, a transformer can change a high-voltage electric current into a low-voltage one (or vice versa). Alternating current flows back and forth through the live wire (green). As it does so, it induces (creates) a magnetic field in the iron core, just like in a transformer (blue arrow). Meanwhile, an opposite alternating current is also flowing back and forth through the neutral wire (orange). The neutral current induces an equal and opposite magnetic field in the core (red arrow). Under normal conditions, the magnetic fields induced by the live and neutral wires cancel out: there is no overall magnetic field in the core and there's nothing to stop current flowing to the appliance you're using. What happens when there's trouble? Now suppose you cut through or damage the cable leading to your appliance. If you cut through one of the power-carrying wires, there's effectively a current "leak" from the circuit, so there will be unequal currents flowing in the live and neutral wires. One of the wires will carry more current than the other, so the magnetic fields they produce will no longer cancel out and there will be a net magnetic field in the core. How does that helps us? The iron core has a third, smaller coil of wire wrapped around it. This is called the search or detector coil and it's wired up to a very fast electromagnetic switch called a relay (transistors, thyristors, and even vacuum tubes can be used instead). When a current imbalance occurs, the magnetic field induced in the core causes an electric current to flow in the search coil. That current triggers the relay, and the relay then cuts off the power. See how it happens in the animation in the box below. Under normal operation, when there is no magnetic field in the core, no electricity flows through the search coil (gray) or relay (blue). Suppose you cut through the live wire (green) with your garden shears—and suppose it takes a tenth of a second for you to chop right through. During that tenth of a second, just as you're starting to cut, there is a current imbalance between the live and neutral cables. 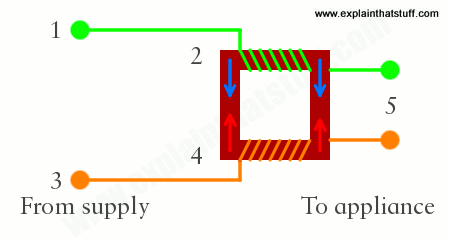 More current flows through the neutral wire (orange) than through the live wire (green), so the neutral wire produces a greater magnetic field (red arrow) in the iron core than the live wire does (blue arrow). The two magnetic fields no longer cancel out. The net magnetic field in the core causes an electric current to flow in the search coil (gray), which activates the relay (blue). The relay snaps open breaking the incoming circuit cables and stopping all power from flowing in as little as 30 milliseconds—faster than an electric shock can stop your heart. Do you need to buy an RCD? "Less than half (49%) [of homes] have a Residual Current Device (RCD) in their fusebox, a vital safety device which minimises the risk of fire by cutting off the power in the event of a fault." Photo: This modern fusebox (sometimes called a consumer unit) has built-in RCD protection, but only on the circuits colored green (generally the main outlets downstairs). The other power outlets (and things like the lighting circuits) don't have RCD protection and are colored red. If you're using power tools of any kind, including things like pressure washers, chainsaws, and lawnmowers, it's a good idea to protect yourself with an RCD—but you might be protected already without even knowing it. Modern household fuseboxes (switchboards), like the one shown here, have built in RCDs on some (but not all) of the household circuits. That means if you cut through a cable or get it wet, the trip switch on the fusebox will interrupt the power and save your life, doing the same job as a plug-in RCD. 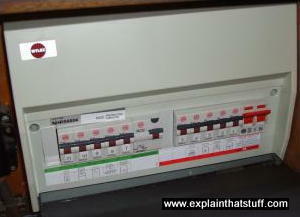 It's vitally important to understand how your fusebox is set up. In this box, for example, only the downstairs power outlets have RCD protection. So if you're using a downstairs plug to power your lawnmower in the garden, you're protected. However, if you were using power tools plugged into an upstairs outlet, you'd need to use a plug-in RCD to protect yourself because the upstairs circuits don't have RCDs fitted. US electrical engineer Charles Dalziel (1904–1986) saved countless lives when he came up with the brilliant idea of the ground-fault circuit interrupter around 1960. He began patenting the idea in January 1961 (in application number 85,364) and was finally granted a patent in October 1965. Among the benefits of the invention that Dalziel listed were high enough current sensitivity to protect people against electrocution, low operating current and energy consumption, and a minimal amount of what he called "nuisance tripping." Artwork: How a ground-fault current interrupter works (with typical US wiring). This is Charles Dalziel's original design, from his early 1960s patent. I've colored it for clarity, using the same colors I used above. The two power wires A, B pass through the brown transformer, as above, and N is the neutral/ground. When the blue trip circuit detects a current imbalance, it interrupts A and B using a relay, transistor, or similar switch. Artwork from US Patent 3,213,321: Miniature differential circuit breaker by Charles Dalziel, courtesy of US Patent and Trademark Office. Haynes: Home Electrics Manual by David Holloway. Haynes, 2012. Electrical Installation Designs by Bill Atkinson et al. John Wiley & Sons, 2012. See "Chapter 14: Residual Current Devices". Reader's Digest Wiring and Lighting Manual by Reader's Digest, 2005. Electrical Safety Handbook by John Cadick et al. McGraw Hill Professional, 2018. 100 Questions & Answers on Electrical Safety by Ray A. Jones. Jones & Bartlett Publishers, 2011. Watch a hacker fry a hair dryer with her radio by Andy Greenberg. Wired, August 8, 2014. How old-style GFCIs can be triggered by radio-wave interference, potentially making them a fire hazard. The Ground Fault Circuit Interrupter by Edward R. Lipinski. The New York Times, June 29, 1997. An old but still relevant article explains GFCIs from a US viewpoint. 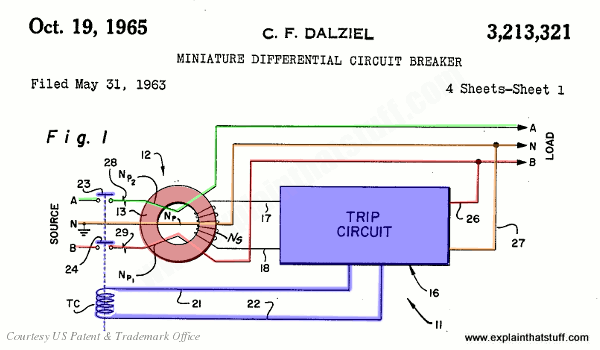 US Patent 3,213,321: Miniature differential circuit breaker by Charles Dalziel. October 19, 1965. The original ground-fault circuit interrupter, as illustrated above. US Patent: 9,148,010 B2: Residual current device (RCD) with earth current sensing by Walter Henry Berryman et al. September 29, 2015. A recent RCD with more sophisticated Earth sensing, particularly designed for countries where Earth connections are not reliable.